Our trials aren’t evident to them. They mistakenly assume that what we’re going through shouldn’t be difficult for us because it wouldn’t be difficult for them. Some individuals may think that, because they’ve been through somewhat the same challenge, they understand exactly what we’re enduring. These ways of thinking are faulty. Some limitations aren’t recognizable, and what’s easy for one person might be difficult (or more difficult) for another. This is the latest picture of my daughter, Caitlin, my husband, John, and myself. We look pretty healthy and happy, right? 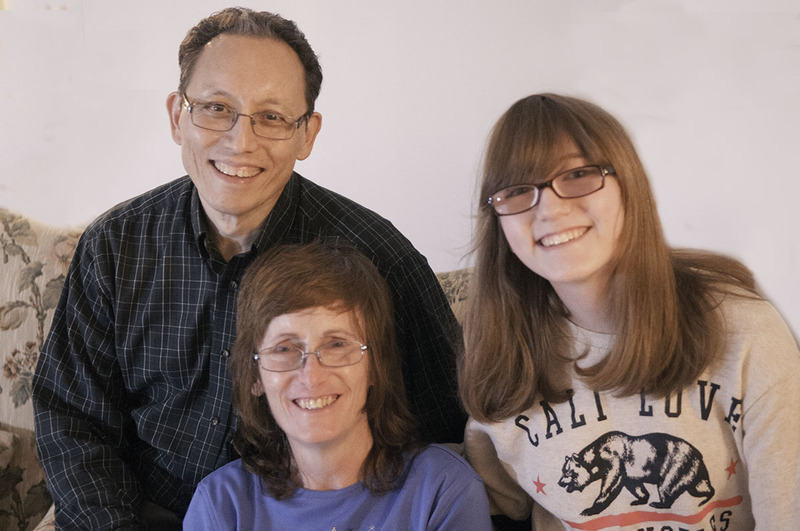 These pictures don’t tell the stories of the constant health and personal battles. Appearances can be deceiving. A friend sent me a link to a great article about social anxiety on amberravatsaas.com In it, the author describes her challenges with the condition. She truly panics when she has to mix and mingle with strangers in even an informal business setting. This is as real a concern to her as being in a closed space is to a claustrophobic, snakes are to Indiana Jones, or heights are to certain people. She is a teenager who has an actual medical condition that won’t allow her to speak to anyone over the age of ten--other than her parents. Public speaking is about as enticing to her as getting a root canal, I’m guessing. When she was younger, she would start crying when she was supposed to give even two-minute speeches among other children. I saw her two attempts to speak, and they were painful to watch. The distress was obviously genuine to her. Her mother stopped her after about five seconds each time. 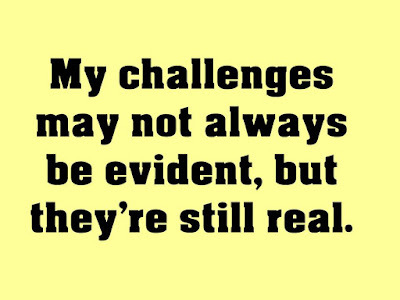 Of course, not everybody has such hidden challenges—minor or major. There are many outgoing people who are superbly comfortable in any social setting, even among large groups. However, that doesn’t diminish the fact that these situations can initiate a very real feeling of terror in some of us. We just don’t always show it. I think it is hard for people who suffer from issues that people can’t see. It’s easier to understand the person in the wheelchair than the person with a hidden health problem, or social anxiety. The same is true of grief. I don’t wear a t-shirt that says “I lost a child”, so it is hard for people to understand the daily struggle to do just the things that have to be done. We hear often about cancer, especially breast cancer. The disease is visible. The trauma is visible. Nothing is understated, private, or concealed in any way. What about those of us with less high-profile, less socially prominent issues? Let’s face it: we don’t get the same time and attention. 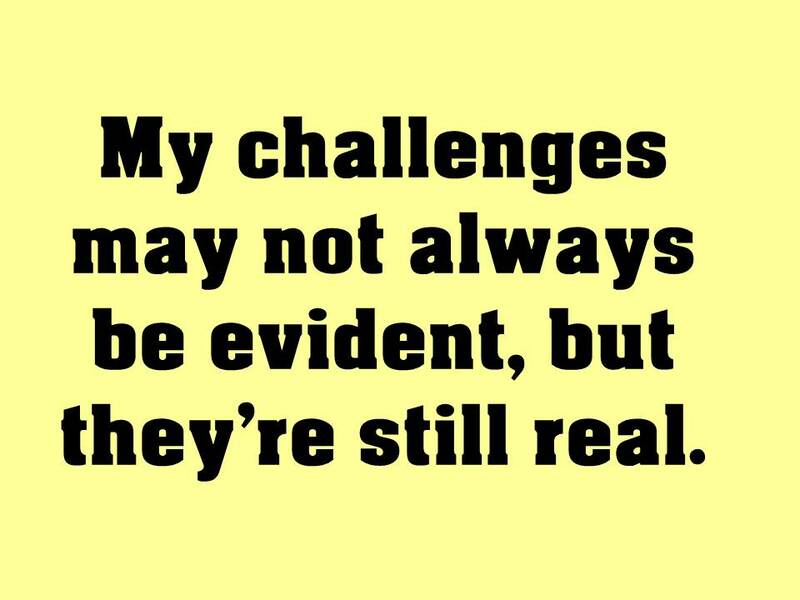 However, the invisible trauma or mental challenges are just as real/limiting as the obvious ones. I just think we all just need to treat everyone with respect and have a general understanding in the back of our minds that many people struggle silently. We are all quick to judge a person who has behaved badly and/or inappropriately without considering why they did so. Sometimes people are struggling and their struggle gets the best of them. Please see more about people who overcame silent struggles in my book, Accept No Trash Talk: Overcoming the Odds. How have you shown acceptance to a silent struggler lately?